« A Song for Jason & Eliz. The Bacon Explosion, a “massive torpedo-shaped amalgamation of two pounds of bacon woven through and around two pounds of sausage and slathered in barbecue sauce,” was invented two months ago and I didn’t hear about it? I’m clearly not paying enough attention. Unbeknownst to Jason Day and Aaron Chronister, the talent behind the Bacon Explosion, they were already behind the times. 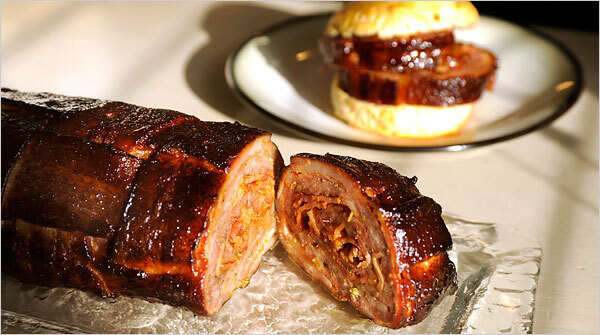 Headless Blogger claims their Sausage Fattie — inspired by Food Proof’s Bacon and Cheese Roll — predates the Bacon Explosion. Messrs. Day and Chronister’s recipe is here. For more bacon fun, visit Bacon Today. The recipe for bacon cinnamon rolls looks delicious and much less likely to result in a visit by the fire department. Check out “What’s To Eat” in the sidebar for more bacon-related links.